Thirty-nine years after the Roe v. Wade Supreme Court decision unleashed the floodgate to decriminalized abortion at the cost of over 50 million innocent lives, we believe that we are very close to stopping abortion in America. 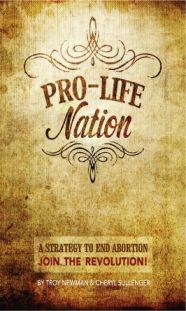 A unified strategy within the pro-life movement could soon bring the final end to this unparalleled national scourge. Over the course of the last 39 years, the pro-life movement has accumulated a number of victories that have made significant strides in several areas, including providing support for women in crisis pregnancies and turning public opinion toward life. However, most efforts have been reactionary in nature… READ THE FULL BOOK. The Pro-Life Movement was stunned by the devastating losses at the polls on November 6, 2012. For the first time in United States history, the two presidential candidates stood publically and vocally on starkly opposing positions on abortion. President Obama doubled down on abortion funding and support for Planned Parenthood. He was unequivocally pro-choice. GOP nominee Mitt Romney was pro-life, promising to de-fund Planned Parenthood and nominate pro-life Supreme Court justices. While Governor Romney was less vocal and engaging on the issue of abortion than his Democratic opponent, he was endorsed by all major pro-life organizations. 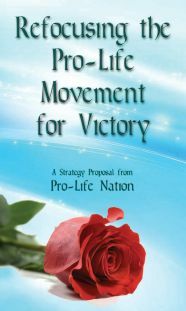 To the surprise of many who expected increased pro-life public sentiment to translate into political victory, Obama won the election… READ THE FULL BOOK.